The English Course is an integrated lower intermediate English language course for students from false beginner to intermediate levels. 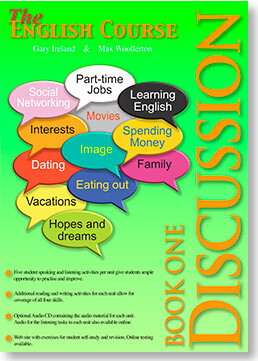 Discussion Book 1 is a lower intermediate level course intended for college, university and senior high school students. The course is designed to promote critical thinking and extensive discussion about a variety of interesting and important issues. 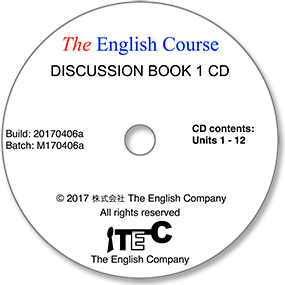 Each unit includes two sets of discussion questions, a conversation audio clip, reading and vocabulary activities and an end of unit task. Each unit is designed to take three 90-minute classroom periods and the course therefore fits into a university year. The classroom work is reinforced with a writing exercise and an online study centre with additional exercises and tests. Though primarily designed as a discussion course, the amount of material and flexibility in the design of each unit allows the book to also be taught with the focus as a listening and note-taking course, a four skills course, or as a task-based language course. The estimated time to complete the tasks in each unit will vary according the level of each group of learners. There are ten questions for students to use with a partner or in a small group. Students match vocabulary items to their definitions. The vocabulary items are featured in the audio clip used in Task 3. Students listen to an audio clip of a conversation. Students must try to identify main points and details. Students compare their notes and answers with those of a partner and assist each other in completing Task 3. Students read the transcript of the audio clip (in Appendix 1) and identify the correct answers for Task 3. Students use the transcript (in Appendix 1) to practise speaking. There are a further ten follow-up questions for students to use with a partner or in a small group. Students examine and practise the language necessary to perform the particular skill that is focused on in the unit. Students work with a partner or in a small group on a project to demonstrate their ability to share their ideas relating to the topic. Students write a paragraph about their opinions on the topic. Students do the online activities on the web site. Click the picture of the book on the left to open and/or download a PDF file of Unit 3 from the textbook. Click on the picture of the disk on the left to link to listen to an audio file for Unit 3 of this title.